Saw your video on how to hook, play and land a trout – very cool. I thought I’d reach out to you and seek your advice. I consider myself to be a pretty good trout fisherman that mostly fishes Brookies, Rainbows and Browns in the UP of Michigan and Southwest Wisconsin. I also have done a fair amount of fishing in Colorado and recently Idaho. Most of my misfortune happens because the fish takes off downstream in fast rocky water and I can’t follow them down without risking serious injury. When I try and hold them up, they spit the hook. 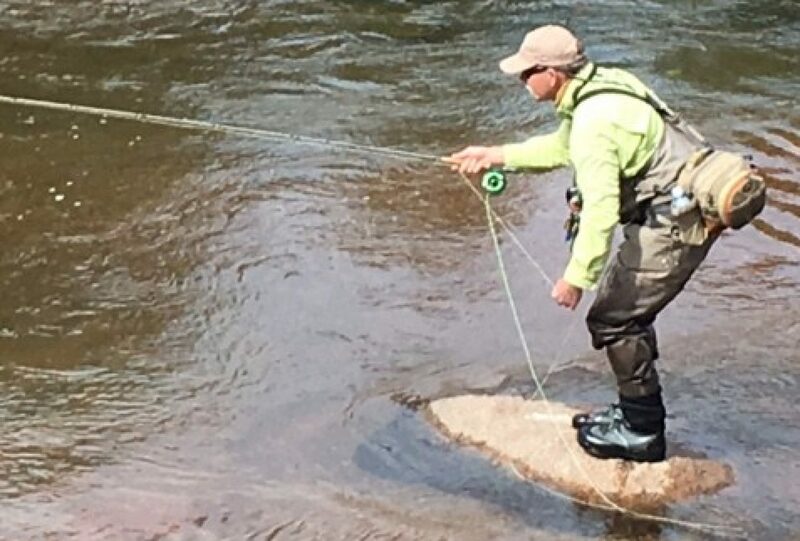 So – how do I bring a running fish in close when he’s downstream in faster, rocky water without pulling yet another damn hook out of their mouth. The last eight big trout I’ve lost have been browns and large cut-throats. Again – smaller fish NP. We have similar issues on the Eagle River. Lots of stuff to trip over and on makes chasing fish unsafe. Yep, you’re right, try to get a solid edge, or lateral position. It’s not unusual for my clients to have to lay the fly rod parallel to the water on the bank side. I find the main problem to be when the fish begin to roll on the surface facing the angler, this forces the hook free. I instruct that any time the fish elevates and rolls on the surface to find an edge and lay the rod flat to the water til the fish submerges. After the fish drops in the columns, bring the rod up to the appropriate angle and resume your battle. Big fish are also suited to outrun your drag and tippet strength as they motor downstream. It’s a real dilemma as you try to let them go or hold them up depending on what’s below you downstream. Fly fishing is mostly science, but a good dose of art is needed to land the fish you talk about in the conditions you outline. Make sure your fly rod is in a high position as they run to relieve tippet pressures, that your drag is set correctly, that your rod, reel, and arm are perfectly aligned, and that you attain those edges quickly. Don’t keep the rod in one position too long, you need to match the fish move for move. Many folks simply freeze. Had a brute on yesterday in exactly the conditions you describe, and was able to land her only because I scooted 30 yards below the angler and scooped her in a soft seam next to the bank. Most often, it takes two for fish in those conditions. You can be much more aggressive than you think if you have the proper rod angles. Once you begin to get control, continue to work the fish into the softest water as you take in line. Be aware the fish is going to make three solid runs on average, so don’t be on the reel when she runs. Work to the soft stuff below you, move carefully if you can once you’re in control, find an edge as she rolls on the surface, and try to control the head. Have you thought of increasing tippet size? Honestly, it’s a good problem to have, but it does get frustrating to have only a knife at a gunfight.